DIY Homeowner Alert: A little goes a long way! This is called “overcharging” and can be likened to a 3-ton system operating at the capacity of a 2-ton system. When you need cooling the most, the system may not be able to meet the demand, depending on how overcharged it is. Additionally, an overcharged system can increase the temperature of the indoor coil, reducing its dehumidification abilities. Dehumidifying is a benefit of conditioned air, and the last thing you want is to be uncomfortable from air that feels sticky or muggy. It’s also important to know that adding too much Freon can cause permanent failure of your compressor (the pump for the refrigerant). Replacing the compressor can often cost more than replacing your entire A/C unit! Fortunately, many air conditioners have an automatic shut-off of their circuitry if the system is overcharged. This feature helps minimize the damage but the system will power off and must be reset. Also the overcharged refrigerant will need to be removed before the system will power back on. There is a misperception that if a homeowner suspects a leak in their system, adding more Freon will postpone the need to have the leak fixed. The bottom line is that if you overcharge your system because you chose to add Freon yourself or have an unqualified technician do it for you, the odds are you will still need the services of a licensed contractor. And worst case scenario, it could cost you big to undo the damage. 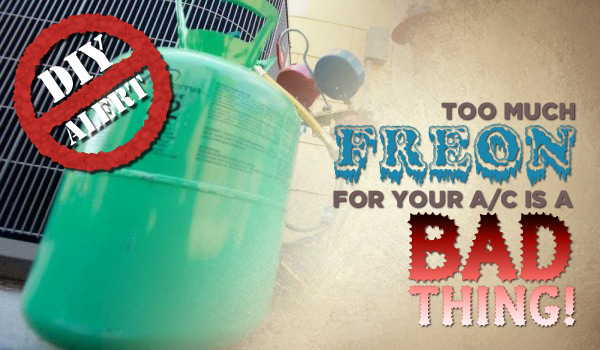 You are much better off having a licensed, qualified company check for leaks, make recommendations and add the appropriate amount of Freon – no more, no less – from the very beginning.